Imaging traveling to beautiful and exciting destinations all around the world, trying delicious food, meeting interesting people, and seeing some of the best views that nature has to offer. Imagine taking photos of everything you see and making money from the entire adventure. And imagine even getting paid to travel by the person who hires you to go there. The great thing is, it’s all paid for via your traveling photographer business. Due to amazing digital technology, it's entirely possible for one person to run a profitable and exciting traveling photography business these days. You just need to understand how it works, whether it’s for you, and how to make money. Let’s get started. 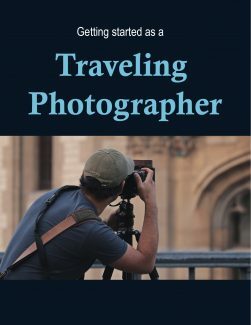 => What Is Traveling Photography? Basically, a traveling photographer’s job is to take photos and possibly a video that record the things that make an area unique, or they may instead be traveling for an event that they are contracted to photograph such as a game, graduation, or a wedding. For example, on any given gig you’ll take pictures of various landscapes, the people, note how the culture is different, the customs that they have, and their unique history. You can depict all of this in your photography. Anyone who documents a local area or agrees to travel to a location-based photo shoot is a traveling photographer. The genre of traveling photography is popular with both amateur and professional alike, with much inspiration derived from magazines such as National Geographic with their photographers like Steve McCurry and Renan Ozturk. Steve McCurry’s most famous photo was made while reporting on the war in Afghanistan, and his photograph entitled "Afghan Girl" appeared on the cover of National Geographic in 1984. You can travel and take pictures while traveling, or you can travel to a location to take pics of something specific like a religious ceremony or another event. Traveling photography can translate into many format styles of documentary photography. Most shooting will be under natural conditions with ambient lighting of a wide variety of indoor and outdoor subjects. Landscapes, people, culture, customs, fun and emotional events, and history are what the photographer frames as his or her subjects. On the commercial side, tourist attractions, hotels, resorts or anything to do with merchandising travel will often be the topics. Traveling photographers must possess a wide spectrum of photographic skills because of the wide variety of the subject matters, which likely encompasses not only portraits and landscapes but also wildlife, architectural, reporting and events. One day you may be taking pictures of mountain scenery and the next food at a five-star restaurant. As a travel photographer, you need the necessary skills to photograph basically everything. Patience is essential as well as being well versed in the technical aspects of shutter speed, depth of field, and lighting. Traveling photography has been popular with tourists ever since cameras were built for amateurs. The famous Kodak Brownie introduced the concept of the snapshot and was very portable. Now with the advent of smartphones, photography is more convenient than ever. Many tourist attractions today are placed in photogenic areas to entice the public to come and take pictures.